A once in a lifetime opportunity came our way last Sunday. Our neighbours Jenny and Alex peeked over the fence and asked if we’d ever had Shanghai Hairy Crab? Thinking this was some kind of joke referencing unhygienic pubic activity I said no and thought nothing of it. Jenny then asked if I knew how to cook crab. At that, I said yes, absolutely. From there, we received a very impromptu invitation for dinner, the only catch, I had to cook it. I found a wonderful website that not only describes how to prepare the crab but also gives you the background to why this is such a treat in the Chinese culture. Click here to view the site and the preparation instructions. Well, if the crab wasn’t enough, Jenny then peeked over the fence again with three gorgeous Wagyu beef steaks from Margaret River, WA (That’s Western Australia), some pork collar and pork cheek for good measure. From there I fired up the Egg with anticipation. While it was coming up to 225F I seasoned the beef with nothing more than kosher salt and a bit of black pepper. With the pork, I seasoned it with some left over rub and then set the meat back into the fridge. Once ready, I reverse seared the steaks, taking my time knowing that this might very well be the best steaks we’ve ever had on the BGE. (I was right!) At a perfect 135F internal temperature, the beef was done followed by the pork collar and cheeks. 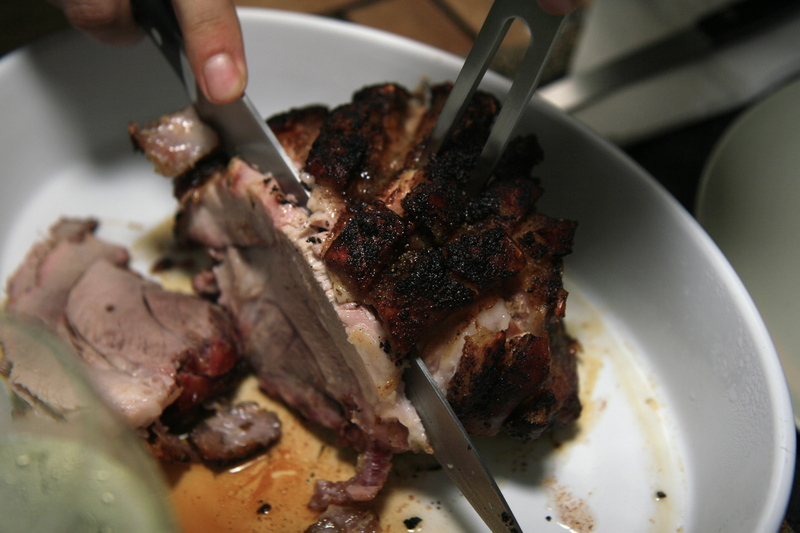 The pork cooked super fast once I had the grill at full tilt. The crab, the beef, the pork, the wine and the company made for a wonderful impromptu meal on a quiet Sunday night! Dinner for one last night. All the kids were either asleep or away and Heather was out for a work dinner, leaving little old me to “cope!” Ha… bring on “Minnie” and a nice piece of salmon, coupled with a Chinese style fried rice. This has to be the easiest recipe for anyone to recreate, and especially handy for a mini egg on those nights when you’re only cooking for one. Set up your mini for direct heat and fire it up to a balmy 400F. Take one of your full size cedar planks and cut about a quarter off. You’ll grill your salmon right on top of that piece and it fits perfectly in the mini egg. To prepare your salmon, drizzle your plank with a bit of olive oil and sprinkle with Kosher salt and freshly ground pepper. Do the same for the salmon but then add a good fist full of brown sugar on top. Let that sit until your grill is ready to go. Place your planked salmon on the grid, close the dome and set the timer for 16 minutes. Once it pings, remove the plank (carefully) and let it rest for about 5 minutes. Get your sides ready then serve. The salmon was delicious and all I can say is that the family missed a yummy meal last night…burp. Yum is all I can say about this dish. If you like your snapper done on the Big Green Egg or on any grill for that matter, you’ve just got to try this recipe out for yourself. 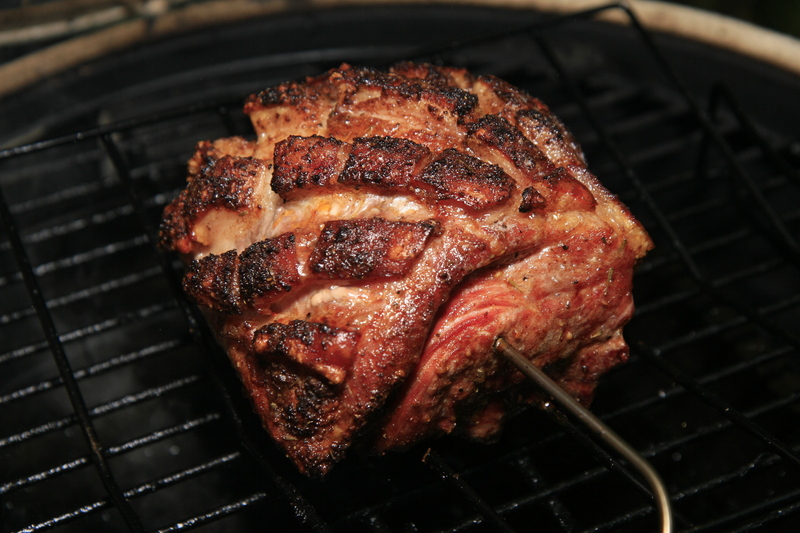 Set up your grill for indirect heat and stabilise the internal temperature at 400F (205C). Get your fish ready by rinsing it under cold water. Pat dry with kitchen roll, score one side of the fish and then coat with olive oil (both sides.) Add your garlic and ginger along with the green onions inside and outside the fish and place it on a rack. Open the grill, place the rack on the grid and close the dome for about 45 minutes or until the internal temperature of the snapper reaches 135F (57C.) This was a pretty thick piece of fish so it took a while longer than usual. Carefully remove the fish once it’s hit it’s internal temperature and place it into a serving dish. 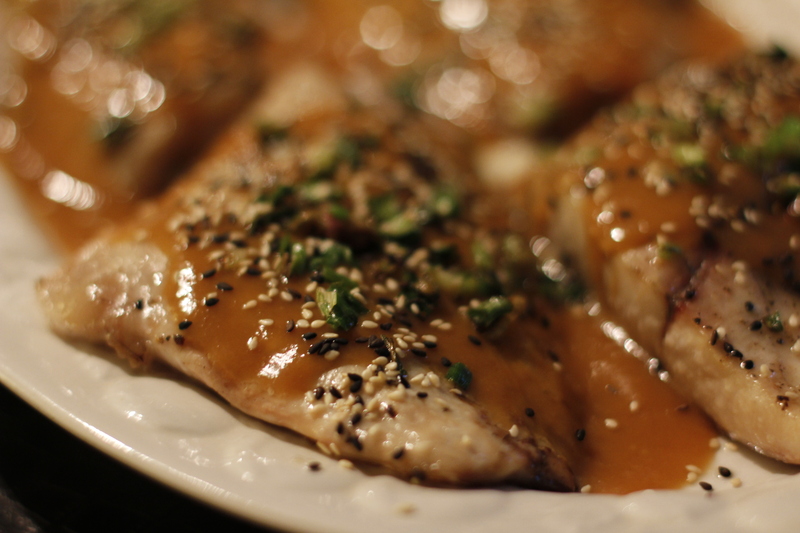 Pour the warm Hong Kong style sauce all over the fish and serve immediately. 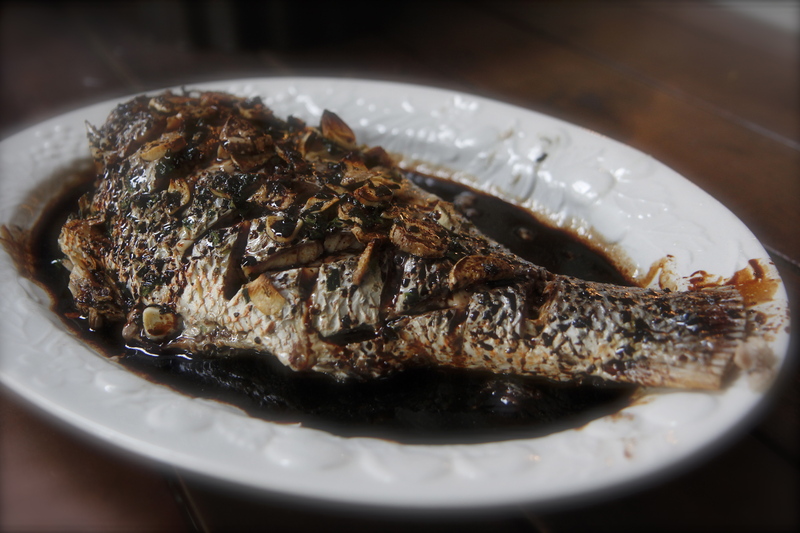 This recipe is normally done with steamed fish but grilling it gives the snapper a hint of smoke that goes incredibly well with this sauce. Huge success! We served up the fish with a simple couscous, pomegranate salad – absolutely stunning Saturday night dish! Hi all, a rare Monday edition of the BGAE blog with this little fish ditty. Tonight I grilled up an entire Sea Bass and prepared it in a pseudo-Japanese style, with a lovely Miso-Mustard sauce and sesame seed/grilled spring onion topping. The recipe is really simple and the result is fantastic. Sea Bass doesn’t give off any fishy smell or taste. It’s velvety smooth and creamy and if not overcooked, absolutely delicious. In a small sauce pan, whisk up the mustard and the water and when smooth add the rest of the ingredients above. Turn up the burner to medium heat and stir it until its a smooth creamy sauce. You can prep the sauce a day in advance but in truth, it’s so quick and easy you don’t need any time at all to whip this up. I set up the Big Green Egg for indirect heat (plate setter in) and stabilised at 425F. Just before putting the fish fillets on, I dropped in a few Apple wood chips for a hint of smoke. I then placed the fish on an oiled rack that sat on top of the grid. As the egg does a wonderful job of cooking from all sides, by elevating the fillets, you don’t need to flip them at all. Saves you from breaking up the fillets mid way through the cook! I set the timer for 17 minutes and when all was said and done…the fish was perfect! Moist, flakey and really tasty! I rested the fish for about 5 minutes, not that it needed it but because I still needed to grill up the green onions. Have a bunch chopped up and then put them on the flat top griddle with a drop or two of olive oil. They’re done in about 2 minutes. Set your fish onto a platter, spoon some sauce over the top and add your grilled green onions and a few toasted black and white sesame seeds for good measure. 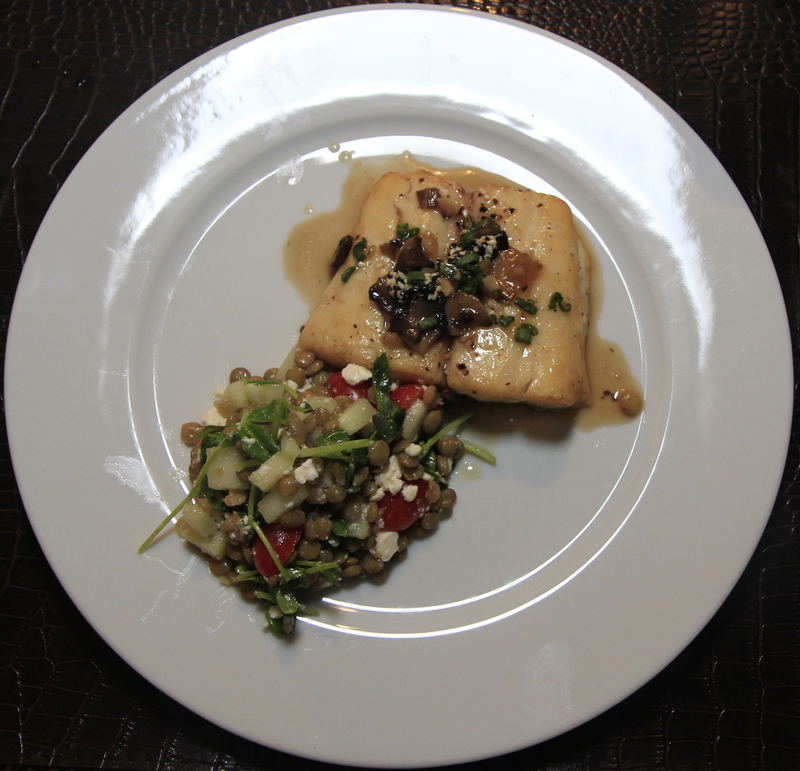 We served up a lentil/feta salad with the Sea Bass and we scored another great result! Enjoy this recipe and let us know how you get along! 3 cups shitake mushrooms, thinly sliced – tonight, I used Portobello mushrooms which gave a really nice earthy taste to the sauce! Soak your cedar plank for at least an hour. As you prep everything else, combine your sesame seeds and sesame oil into a small metal bowl and place it aside. Keeping it soaking for a while will produce and extraordinary taste as you spoon a bit on top of your fish. The sake sauce is quite straight forward actually. Combine your mushrooms, stock, sake, soy sauce, ginger and garlic into a saucepan and simmer on low for about 15 minutes. The initial taste will be super salty but wait, the magic has yet to happen! Once your timer “bings”, add the rice wine vinegar and the honey stirring in well. Again, return the sauce to a simmer and let it sit for another 15 minutes. Give it a stir once in a while too! Combine your cornstarch and water and mix it until its all dissolved and becomes a white milky liquid. Using a whisk, stir in your mixture and don’t stop the stirring’! You’ll soon have a slightly thickened sauce and you’re almost ready for the final bit. Now, the fish! Place them on a well oiled (olive oil) cedar plank and season with Kosher salt and freshly ground pepper. Fire up the grill ahead of time and get it to about 450 degrees F. Place the plank along with the fish on it straight onto the grid for direct heat grilling. You’ll leave the fish there for 15 minutes or until the fish starts to turn a bit brown on the outside and super crazy tender on the inside. Spoon a good heap of mushrooms and sauce over the fish fillets and then add the sesame mixture. Finally, sprinkle your scallions on top of it all and serve away! Heather’s lentil salad was an amazing compliment to the fish. All in all, a perfect 10 and a highly advisable dish for any backyard griller! Heather and I decided that we need to get a bit healthier and the first step is eating better. The past few days we’ve started new routines that will hopefully help us maintain a better and longer life! 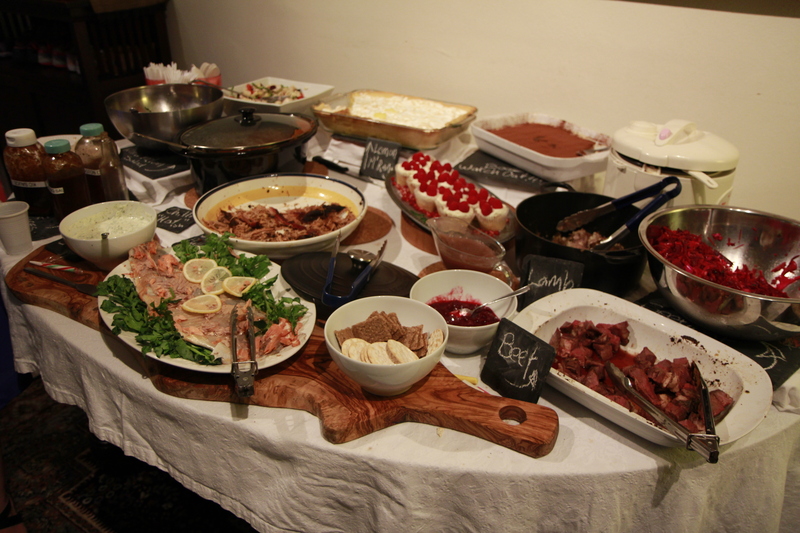 So tonight’s meal was intended to start a bit of a new tradition…the Saturday fish night. As much as we would have loved some beer battered “fush n’ chups”, we went with a really simple, grilled whole golden snapper. The preparation for this meal is extraordinarily easy. Buy a fresh snapper and have the fish monger clean it out for you and de-scale it. Take a really sharp knife and score about 6 grooves on each side of the fish and stuff the grooves with a half a lemon wedge, thinly sliced garlic and a pinch of rosemary. Do this on both sides then season the fish with some coarse sea salt. Plonk your fish into your brand new greased up fish griller (Heather, ye of little faith) and put it over direct heat set at 400F. Set your timer for 10 minutes then turn the fish and let it grill for another 10 minutes. Total time is 20-25 minutes. 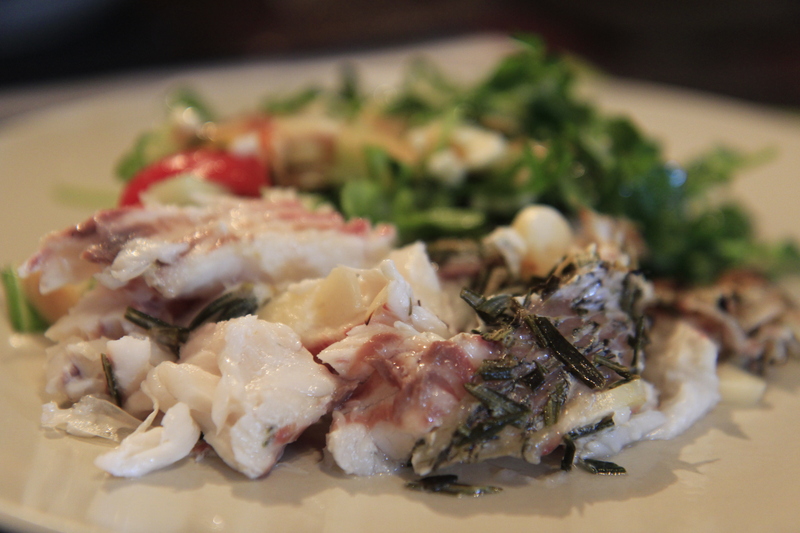 We served the fish with a great salad consisting of rocket, tomatoes, feta, baby pea sprouts, cucumber with a great dressing of olive oil, white wine vinegar, tobasco, and salt and pepper. Simple, tasty and wait for it…..good for you! Enjoy! Combine the above in a non reactive bowl and whisk it until smooth. Set aside about 6 tbsp for drizzling after you’ve grilled your fish. Set up your grill for direct heat and stabilise at about 350-400F. I was impatient and grilled for 20 minutes at a slightly higher temperature and slightly overdid it. Anyway, with steaks like these, 15 minutes would be the max I’d advise on direct heat. Also, the hotter the grill, the harder it is to ensure the salmon skin doesn’t stick. I may try a thin rack next time over the main grid. 4 tbsp toasted sesame seeds (toast them up in a dry pan and make sure you watch out for burning. Just a few minutes will do and ensure you shake them around. Once they start to change colour and go a lovely brown shade, take them off the heat and set them aside. 2 tbsp dark sesame oil. Cook the noodles in a large pot with slightly salted boiling water and a touch of vegetable oil to prevent sticking. Cook for about 5 minutes, drain and rinse immediately with cold water. Then, drain it again and add the noodles back in a big bowl, adding the toasted seeds, shoyu and sesame oil. Mix it really gently but really well so that the noodles get coated in all that lovely stuff. Cover the bowl with some cling film and pop it in the fridge until you’re ready to serve. 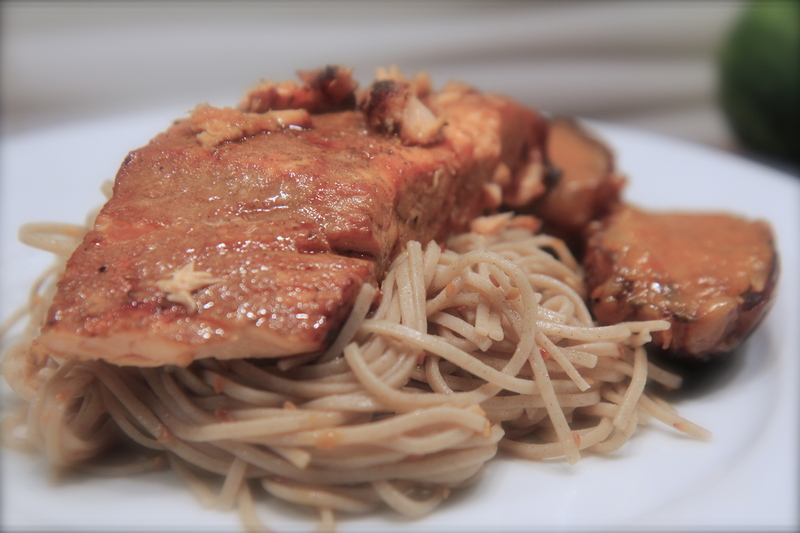 OK, set up your pates with a nice helping of soba noodles then lay your salmon steaks on top. Don’t forget to drizzle them with the leftover wasabi sauce. We served the salmon with grilled miso eggplant and that recipe will come tomorrow night…. Overall Heather Rating: 7/10 (marks off for overdoing the salmon! )….at least I’m honest!